Today is my niece’s turn for an Auntie Anna day at the Olympics. She loves horses and anything to do with them. 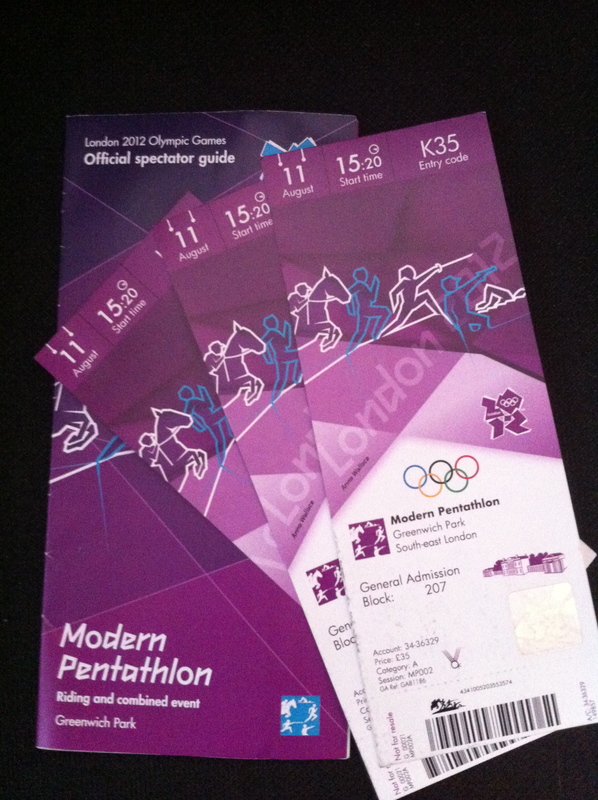 I was so pleased that one of the tickets I managed to get in the original Olympic ballot was for the Modern Pentathlon, equestrian session. 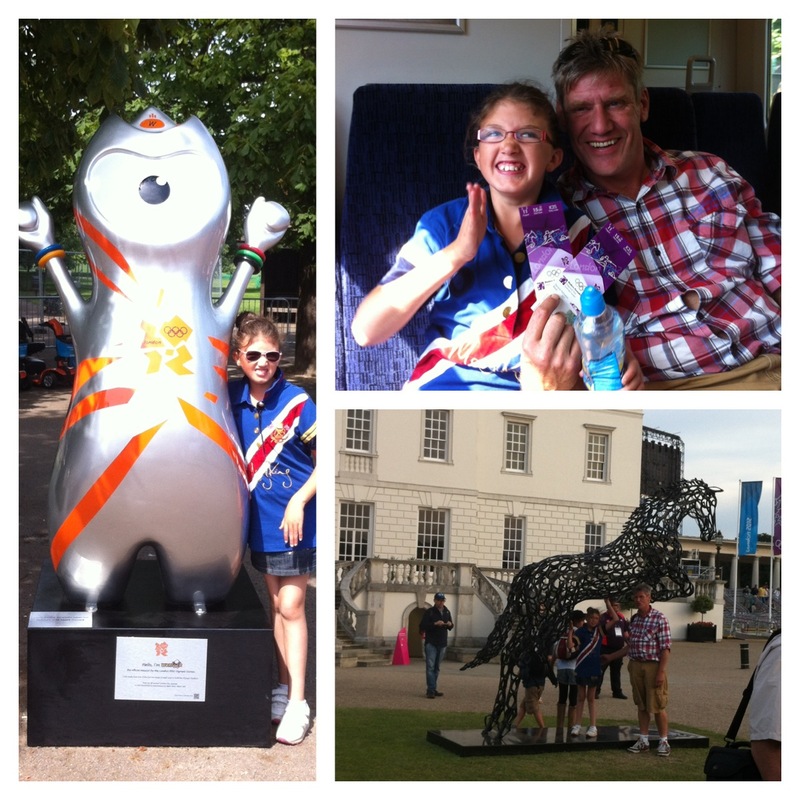 Tori has patiently waited whilst lots of other Olympic events have taken place; when her brother and I headed off to the Olympic Park for basketball; to watching it unfold on the TV; and spending time in Hyde Park with her mum watching it on the big screens. I therefore wasn’t particularly surprised when my brother announced that Tori had been awake until 2am this morning and kept waking up to ask ‘is it time yet’? I think the picture of Tori and my brother on the train on our way to Greenwich Park says it all. She truly was excited! We were blessed with beautiful sunshiny weather too, a huge blessing as we walked from the train station at Blackheath winding our way through the little streets with some stunning houses, colourful windowboxes and lots of bunting, across the parkland and then into the venue. 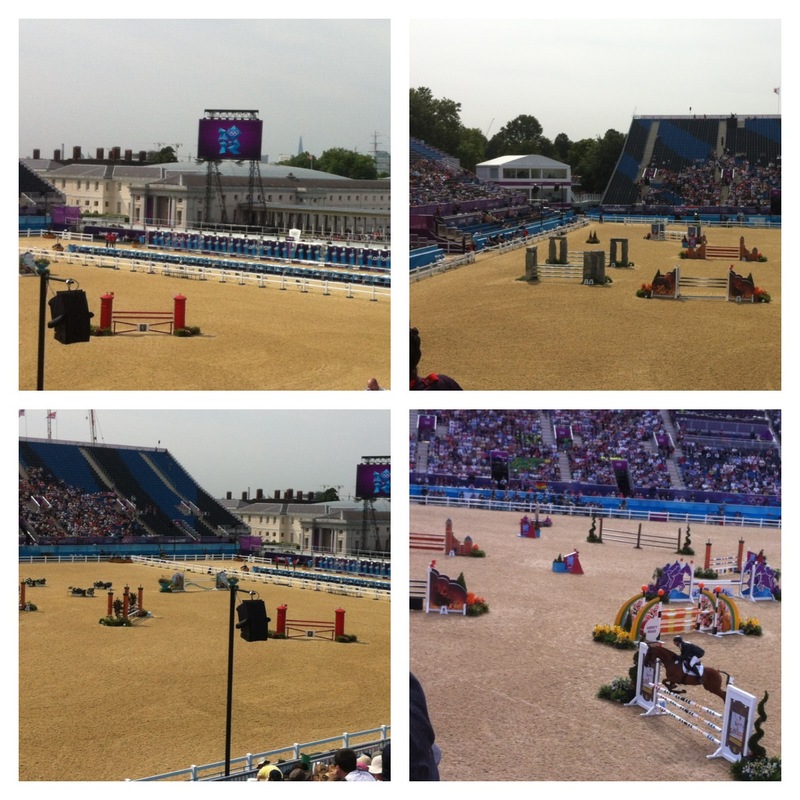 By arriving via Blackheath train station we were able to walk right through Greenwich Park and see some of the jumps that had been used for the cross-country equestrian course in the Park. What fun must the jump makers have creating something that not only complies with all the regulations of equestrian jumps but also eclipses Great Britain and an element of fun. I’ve looked at some pictures I took but also added some from the internet…. love that we have sensible jumps of the moon and planets but also ones that represent Wind in the Willows too. 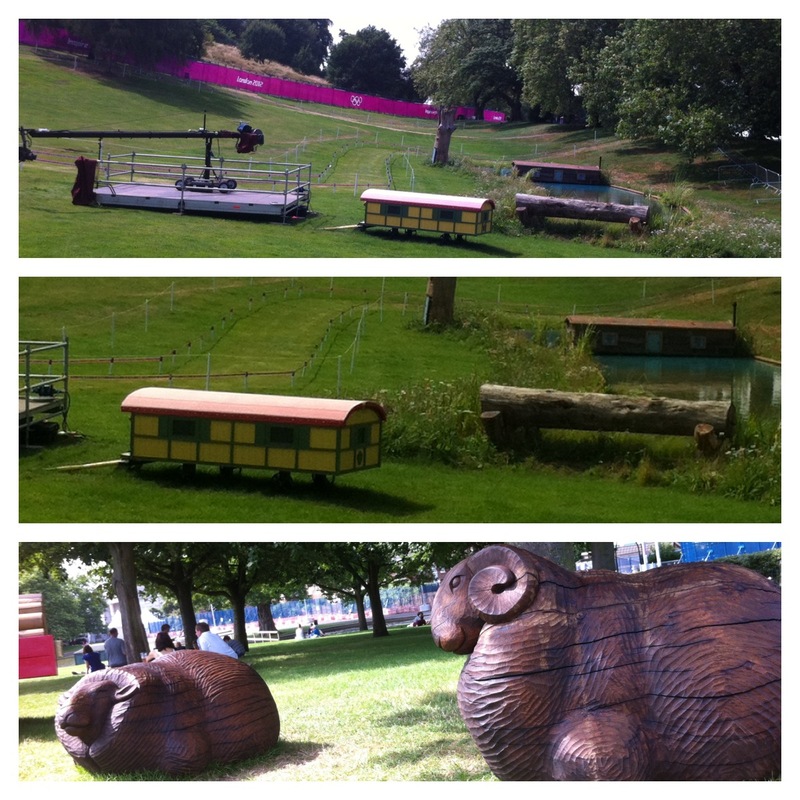 I also loved the wooden sheep and rams that made a fabulous place to sit and eat our lunch in the sunshine! Nice and early we headed into the stands and took our choice of seats. Half way up and able to see the big screen, the entrance point for the horses, the shooting and also exit and entry points for the run. We were sorted! But first, a little lesson. 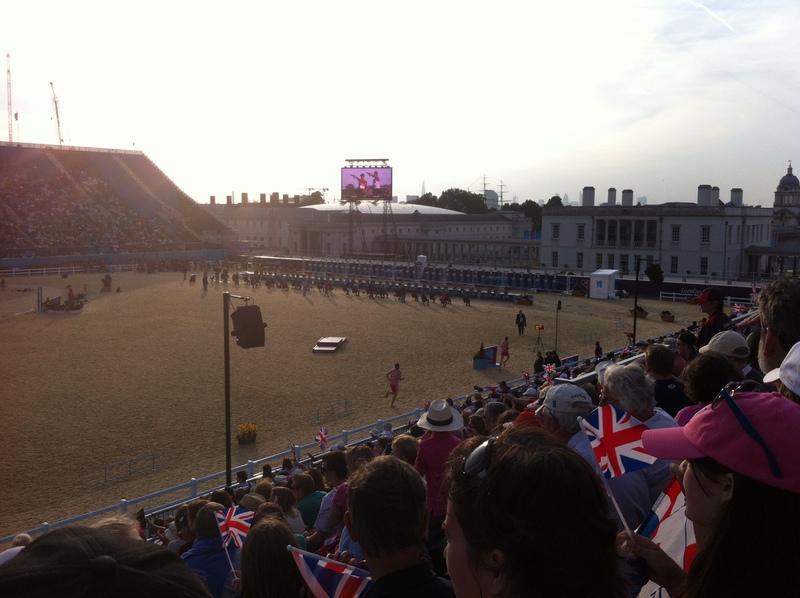 What is Modern Pentathlon and what’s it’s history? The history – Modern Pentathlon was championed by Baron Pierre de Coubertin, the founder of the modern Olympic Games, and has its origins in a 19th-century legend. The story goes that a young French cavalry officer was sent on horseback to deliver a message. 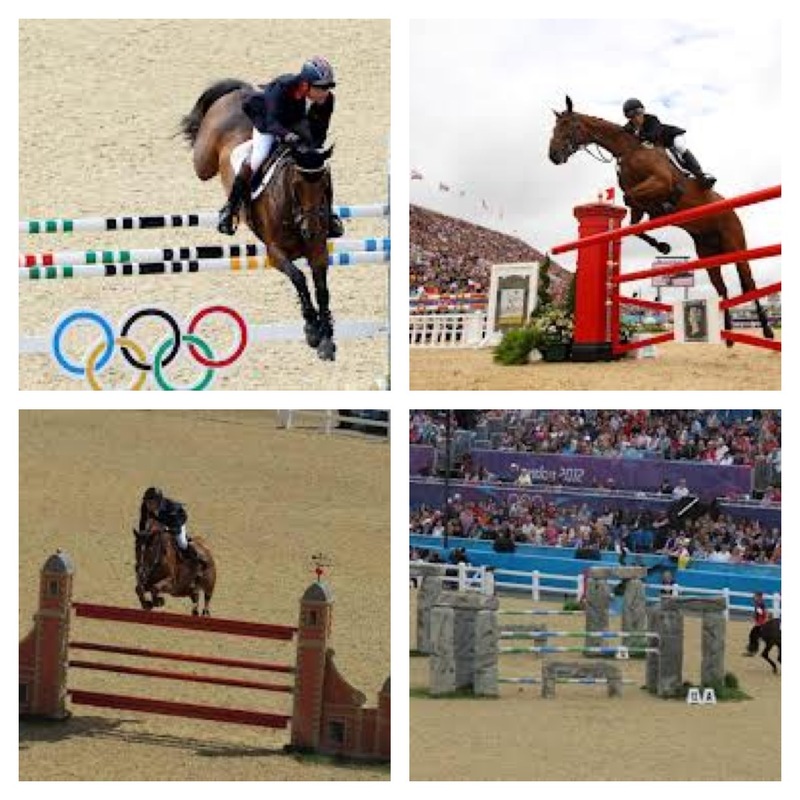 To do this, he had to ride, fence, shoot, swim and run – the five challenges that face today’s competitors. A century after Modern Pentathlon made its Olympic debut at Stockholm 1912, London 2012 is the first Olympic Games where the ‘combined’ format is being used for the running and shooting elements, and is the first Games to incorporate laser pistols. 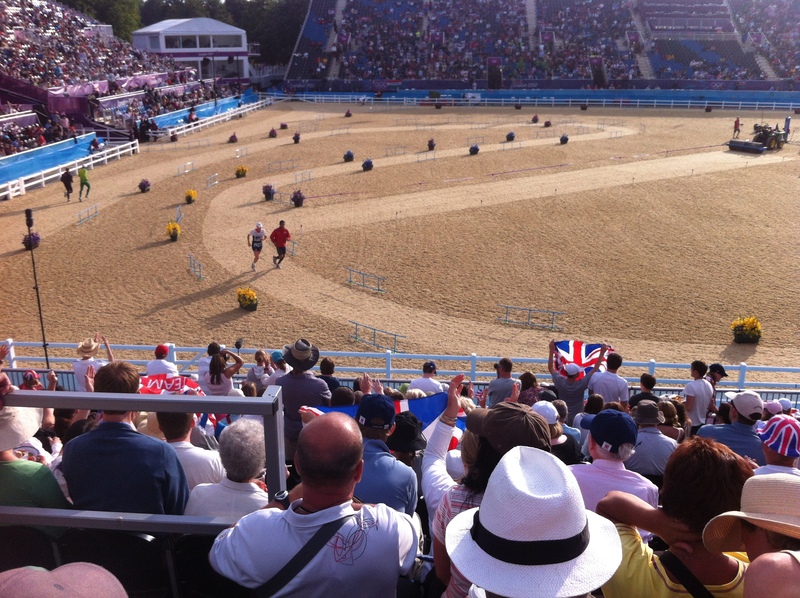 The basics – Modern Pentathlon competitions are conducted over a single day. The first element is fencing, for which athletes are required to fence against every other athlete. 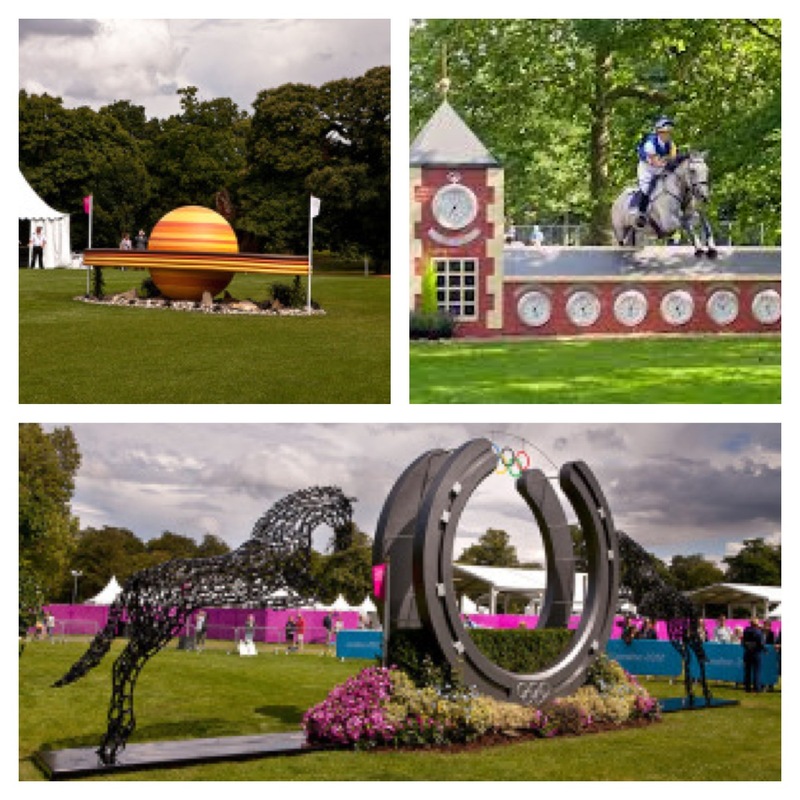 The fencing is then followed by swimming (200m freestyle) and riding (jumping over a 12-jump course). Athletes are given a score for each element of the competition. After the first three elements, the athletes’ total scores are converted into a time handicap. The handicap determines the starting times for the combined run/shoot where athletes are required to hit a target a total number of 15 times and run a total of 3km in a sequence of three laps. The winner of the competition is the athlete who crosses the finish line first. 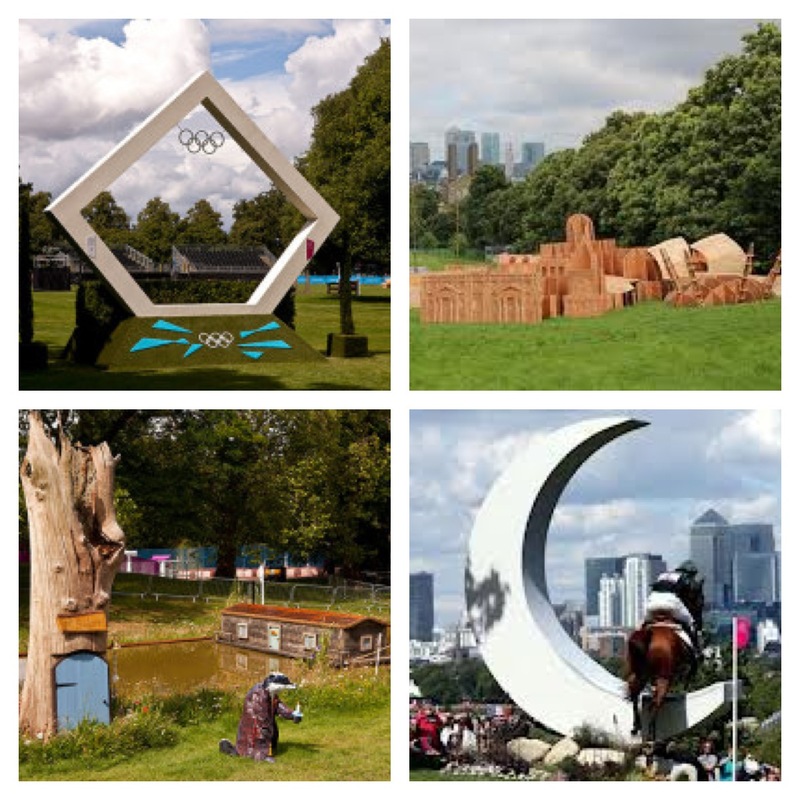 By the time the competitors reached Greenwich Park (and us) they had already competed in two elements, fencing and swimming. As above if they are to fence every other competitor that is 35 matches AND then the rest of the competition on the same day! The added ‘twist’ to the riding event is that they don’t know which horse they will get either! The officials have whittled down to the last 18 from over 100 horses that they’ve been watching and working with for the past year. 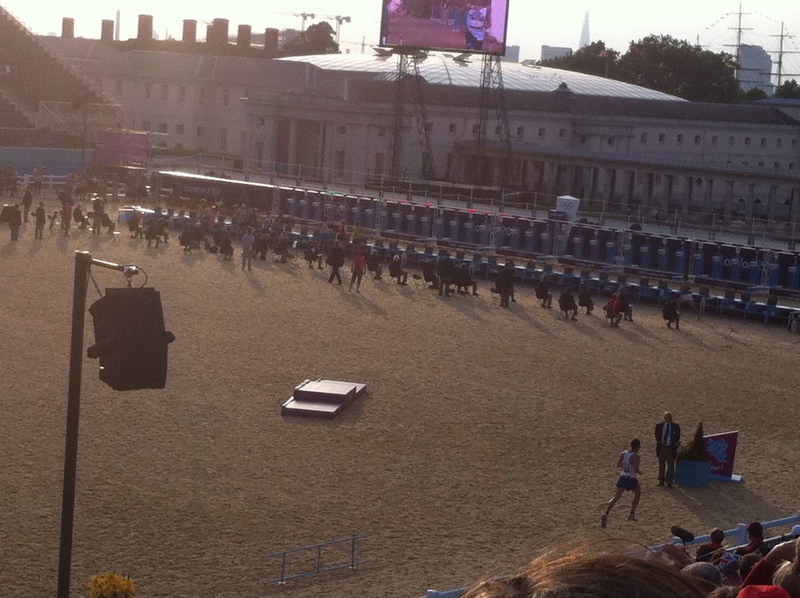 The chap in the lead at the start of the riding event gets to choose a numbered dice from a champagne bucket determining his horse and then the rest of the field get the sequential next horses. (I love the eccentricity of this selection process, particularly the champagne bucket, of course!). The riders then have 20 minutes in which to bond with their horse limited to only 5 practice jumps, before taking to the ring. Each horse is ridden twice during the competition. This selection process and the use of horses that the riders don’t know is so that the test if of the rider’s horsemanship and control rather than the horses’ ability. 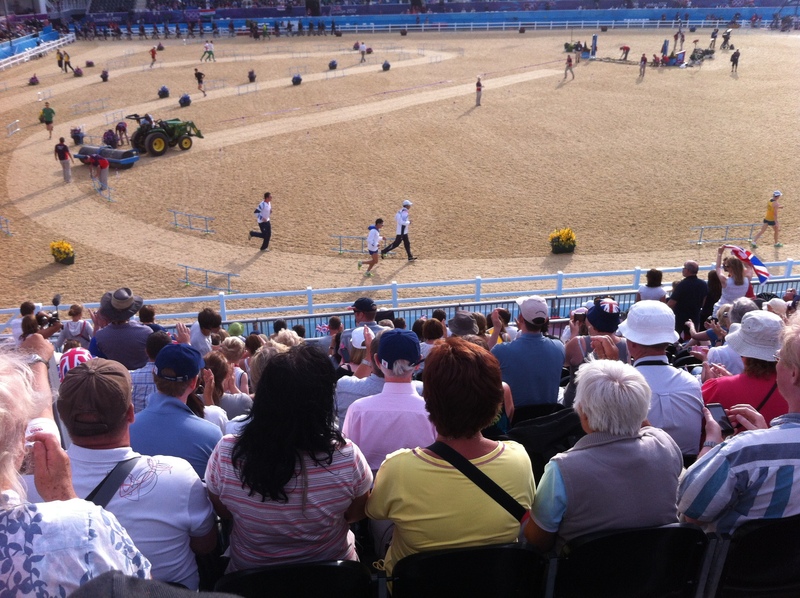 We saw some amazing control and also some very wilful horses, not least when one threw their rider off and then fell on his legs – truly thought that would be the end of the rider for this competition but after the horse was caught by the gamesmaker volunteers, the remounted it and reminded it who was boss as he completed the course. He didn’t have a great round but he did get round and went on to complete the run/shoot too but I wonder how bruised he is now! Once again though I really have to give some more praise to the fantastic jump design – there’s a few close up pictures below and hopefully you’ll be able to zoom in to look at some of the others too. Tori was often up on her feet as a horse jumped well or indeed was playing up. 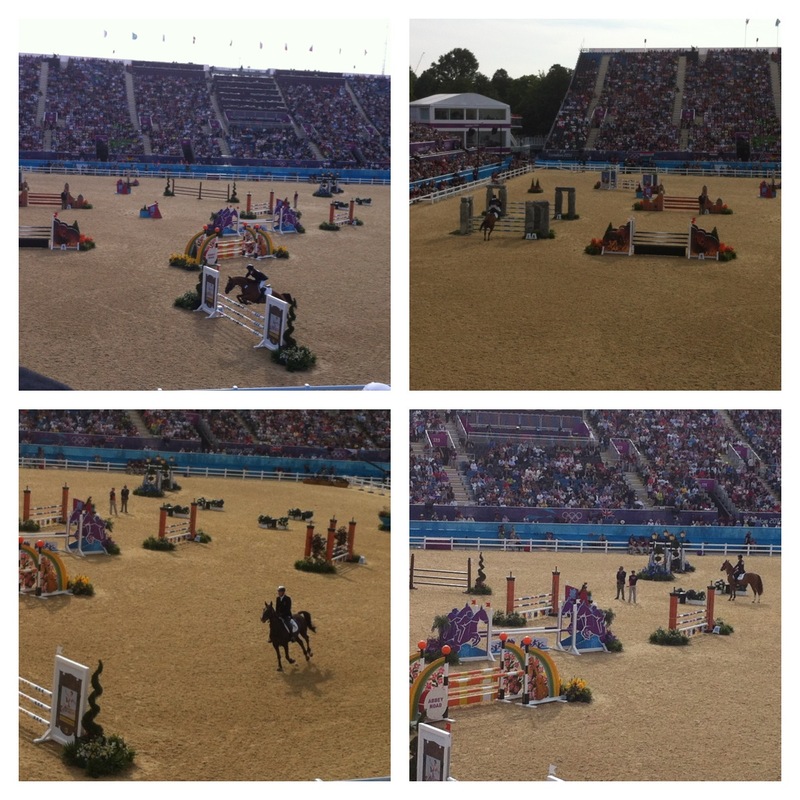 Incredibly tense and you could feel the tension of the riders, on an unfamiliar horse, jumping within 75 seconds (in order to avoid penalties) but also attempting to get a clear round (also avoiding penalties). After the riding element, the scores were tallied and our two GB teammates were in 8th and 11th place (I think!). The volunteers then moved in and very swiftly removed all the jumps, raked the sand and set out the track for the run. Barely was the track set up before the athletes started warming up. Tori, my brother and I all had our fingers and toes crossed that Team GB had been practicing shooting and indeed had some energy left in those legs for the run. How difficult must it be to do the shooting/running as one combined element. The competitors set off seconds apart (this is where the time penalties earlier are critical) and they run the short distance to their shooting posts. They then need to get 5 shots on target before they can leave and head out for their run. The run leaves the arena and travels through part of the Park – a hilly part of the Park and an added difficulty level. 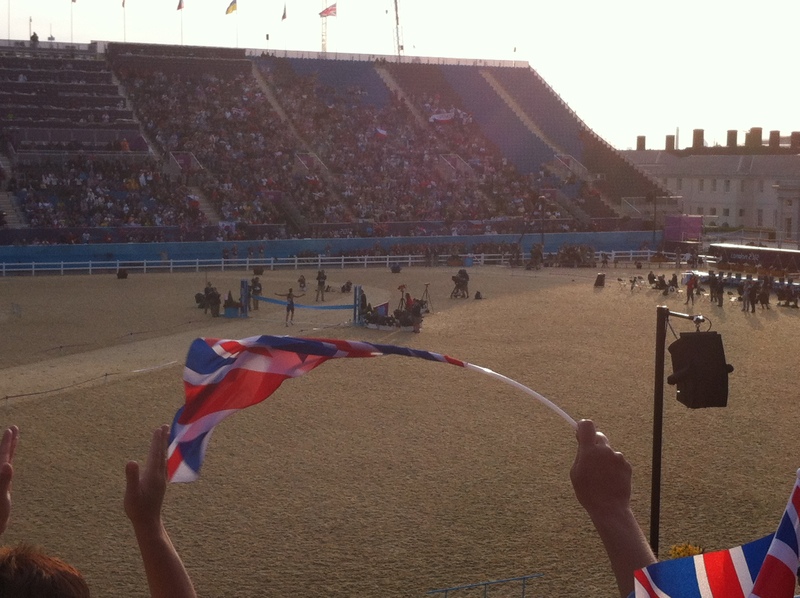 The cheers were incredibly loud as the re entered the Arena followed the pathway to the shooting posts and did it again. Three times and then to the finish line. Incredible and frustrating to see a missed target which then means a further time disadvantage for the run. Eeek. China had held the first place position right up until the last run where they were overtaken by the Czech athlete. D Svobada (Czech) crossed the line for the gold medal, Z Cao (China) for silver and A Morosi (Hungary) for bronze. Team GB, N Woodbridge finished in 10th place and S Wheal in 13th place. Another ‘thank you’ really must go to the volunteers, forces and organisers at this venue. Truly incredible job they’ve been doing, always so cheerful and upbeat and incredible helpful. THANK YOU. We had a brilliant day, ended up in Hyde Park BT Live site with JoeJoe, my sister-in-law and some of her family too. We were able to watch Tom Daley dive for his well-deserved bronze medal and to, once again, take in a truly Olympic atmosphere. I am so pleased that my brother has also been up to London to immerse in the incredible buzz of it too. To be able to share my Olympic experiences with my family and know that we’re creating memories that I truly hope will last forever has been amazing, inspiring. 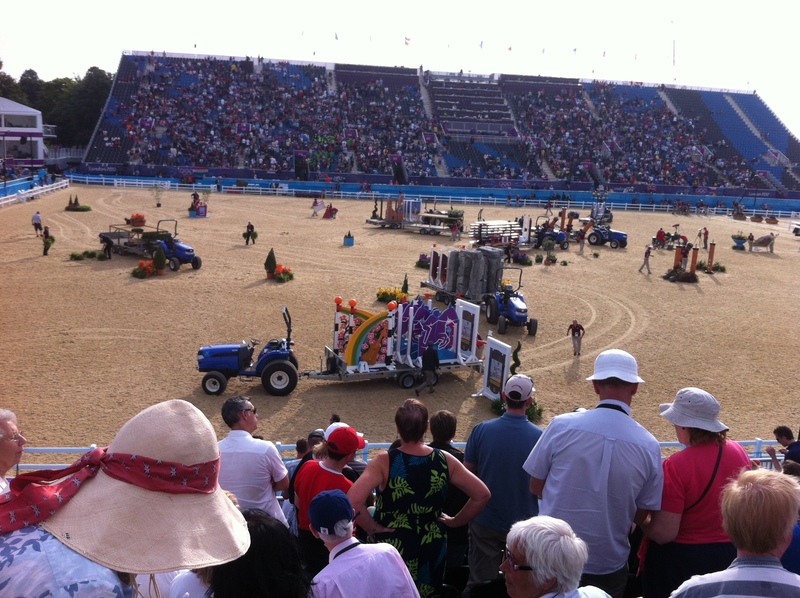 This entry was posted in Living and tagged London 2012, Olympics by AnnaGoAnna. Bookmark the permalink.